The discovery of a catastrophically destroyed watery asteroid in the star system GD 61 has set scientific pulses racing. The discovery of an asteroid at such a distance is due to a great deal of forensic work by the scientific team involved. Clearly, such a small object could not have been directly imaged. 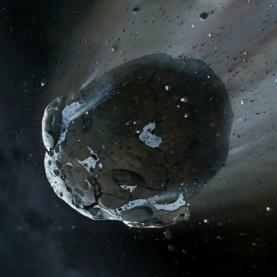 Instead, by examining the chemical constituents which provide the distinct spectrum of the the light emerging from the white dwarf star, the team have realised that a large asteroid, whose rubble is strewn about the GD 61 system, has deposited a massive amount of water onto the surface of the tiny star (1). This, in turn, has led to speculation that what is seen in the GD 61 system parallels a similar mechanism in our own early solar system. The puzzlement surrounding the deposition of water on the early arid Earth surface (whose own water was driven off by the Sun's mighty energy output early on) might be solved by considering a similar watery asteroid striking our world. Previously, it was thought likely that comets provided this veneer of oceanic water across the Earth's surface, through an accumulation of deposition over eons. However, isotopic analysis of water across the solar system indicates that the Earth's water better matches the asteroids in the main belt between Mars and Jupiter than it does the more distant comets. In fact, a watery asteroid the size of Ceres might, on its own, have provided sufficient water through an early, titanic collision with Earth (2). That said, wouldn't there be more evidence of such a monster collision extant in the Earth's vicinity? Would not the Earth's orbital path still be strewn with debris from such an event? It seems remarkable that such an asteroid might have simply been 'absorbed' by the Earth - eaten whole, as it were. As regular readers will be aware, I have promoted a more 'left-field' explanation for this puzzle. Might the Earth not have started life as a watery world itself, but located between Mars and Jupiter? Catastrophic migration early on then pushed Earth closer into the inner solar system, leaving behind the debris field of the collision in the form of the current asteroid belt. This, then, would explain why the isotopic ratios of water to heavy water are the same for Earth and the asteroids. After all, they formed in the same part of the solar system. And if the colliding body was a gas giant-like Dark Star, then that would also explain the lack of other-worldly rocky debris. The resultant hydrogen and helium released from the wounded Dark Star would leave little trace over the long term, as it would be driven away by the Sun. As a fine artist, I am occasionally commissioned to paint pictures for CDs, books and brochures. When an ex-pat Brit approached me to create a complex painting for his debut fantasy novel, I carefully listened to his requirements and drew up a large painting to meet them. He wanted the painting to include both the front and back covers. 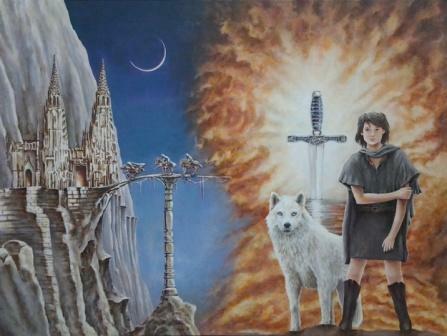 The front cover was to have a roughed-up lad with a white wolf, set in front of rolling flames. Also in the picture was needed the sword Excalibur rising from water, and the visage of a villainous creature. The back cover needed a dark castle set into rocks with several dark riders crossing a bridge towards it. With the exception of the villainous baddie, whose inclusion unduly cluttered the painting, I included all the required aspects of the work in great detail (opposite). Unfortunately, upon seeing an image of the finished painting, the author was not impressed. And that was that. Because I'm not keen to provide 'free' work to the author, I have not provided a good quality image of the painting, and subsequently will not be placing such an image onto the Internet. I'm disappointed by this outcome, as a great deal of work went into the work, and the deposit I took doesn't really compensate for this (I'll require larger deposits in future). Anyway, I still have a rather striking and unusual fantasy painting to exhibit, and there's an opportunity to do so locally in the run-up to Christmas. Even so, due to the amount of time that went into this, the amount to time I had to devote to the Dark Star Theory this month has been rather low. So, apologies. I'll try to catch up as the month proceeds. An independent, professional book reviewer has published a very positive review of my 2005 book 'Dark Star'. There aren't that many reviews of the book around, so I wanted to highlight this to readers who... well, have yet to read it! There are always interesting discussions on the lively Dark Star Planet X forum on Google Groups, which I moderate. We discussed the writings of Immanuel Velikovsky recently, and how he picked Venus as the rogue planet which dealt out much catastrophic activity. If he had been aware of the hunt for Planet X when he was first trying to solve problems of myth using astronomy, then he might have framed his theories in a different way. Sitchin's ideas came along a little while later, with the concept of an undiscovered rogue planet acting like a comet with a 3600 year orbit. It was certainly in my mind originally that Sitchin's orbital period of 3600 years would fit fine with a sub-brown dwarf as a solution to the Nibiru enigma. But as the sky searches in infra-red have come back blank, then it seems most likely that such a nearby sub-brown dwarf should really have been imaged by WISE by now. Now, there are a number of reasons why there's the possibility that it's been missed, but I've become convinced over time that 3600 years is simply too short a period. A 'Dark Star' would need to be much further out than this to have evaded the most straightforward IR detection in recent years. However, bearing in mind that the word 'Nibiru' means 'ferry', then it seems probable that Sitchin's world is a go-between in some way- either as a planet/comet/comet swarm in its own right, or even a rather remarkable artificially-created mode of transport for the Anunnaki. 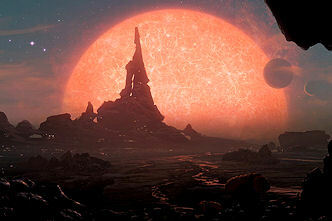 Nibiru's appearance in the heavens might be this colossal structure going into orbit around the Earth, and reflecting reddish light to observers down below. This would be similar to the arriving Nommo craft described by Robert Temple. The Anunnaki system, then, might be far more distant- rather more like the classic Nemesis object, deep in the Oort Cloud. This is all just further speculation on my part as I try to juggle all the various constituents of this great puzzle. More weird goings on in the DarkStar household. We had some friends over for a meal and were just sitting down in our dining room amid dim lighting, great conversation and a happy atmosphere. Suddenly Mrs DarkStar became visibly unsettled and asked us if we could see the bright light on the carpet to her immediate right. No, we said. Was she having a migraine? No, she said. She kept looking at the same spot peripherally, and then became really agitated. She fled the room in tears. Greatly concerned, I followed her out to the hall, wondering if she's spotted something spectral instead (not something we would necessarily share with our visitors that evening, but not entirely unknown to us here!). Mrs DarkStar had composed herself already, put it down to her migraine headaches from earlier that day and we returned to a pleasant meal, happy that she was now okay. A glass of wine later and everything was back to normal. Later, I asked her whether she'd seen a ghost/spirit? Oh yes. Not only that but she'd felt its presence - a male stranger giving off bad vibes. Fortunately, he hadn't stayed about once she reacted emotionally to his presence, and has, fortunately, not returned since. I wondered what the evidence was in that briefcase in the clip, which seemed familiar. Researcher Damon Elkins indicated to me that it was similar to a copy of a clay artifact housed in the British Museum, which is described in Zecharia Sitchin's book 'The Twelfth Planet'. 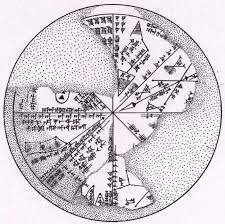 This disc, sketched out in the shape of a trivial pursuit board, was an Assyrian artifact originally found in the Royal Library in Nineveh, and seems to include "arrows, triangles, intersecting lines, and even an ellipse - a geometric-mathematical curve previously assumed to have been unknown in ancient times" (1). Early speculation in the astronomical community was that this disc was, in fact, a planisphere, although some of the accompanying text seemed to point to magical incantations. Sitchin evaluated much of what is known about the sphere and concluded that it provided evidence for the existence of the planet Nibiru, and the journeys to and from that world by the Nephilim. More recent speculation has considered the possibility that the disc points to a catastrophic event that may have been connected to the destruction of the Biblical Sodom and Gomorrah (2). Yikes!